2 – artillery had guns which shot iron balls (1-2 per minute) and howitzers which launch grenades. Both could be charged with Canisters (austrian variant: Schrotbüchseln or Kartätschen) (3-4 per minute). 3 – artillery fire became less effective after 600-750 meters. All used grenades in rough and hill terrains (grenades exploding generated 8-12 splinters), while balls and canister were good in plains and on little distances. Canister was almost effective till 450 meters. 4 – Austrians had the smaller guns (3 pdr). Their 12 pdr. gun was less effective of the same French caliber. It was effective as a French 8 pdr. gun. Austrians and French guns were similar as for the angle of shooting (from 50% to 60%). Bavarian guns were better (70-80%). On 1809 the Austrians had (in each one of their 6 Corps) 2 ½ guns for 1000 men (3 guns per 1000 as reserve). The French had 1,7 guns per 1000 men (1 ½ guns per 1000 cuirassiers in the Grosse cavalerie divisions). The Bavarians had 2,9 guns per 1000 men (2,2 considering the single divisions). The Rheinbund artilleries had around 1,9 gun per 1000 men. The Austrian supremacy was evident. So what happened in March-April 1809? Simply the Austrians lost the great part of wagons, caissons and ammunitions during the chaotic retreats of the campaign and so they lost effectiveness. In France were built some new wrought-iron guns  (en fer forgé) together with “fusils” barrels made with a superior quality iron. Proofing these last ones, only 4 over 604 brought after shooting. General Eblé launched war-rockets at angles between 15°-25°. New organization at the “École Politechnique”; pupils now had to live in the barracks and not in the “civilian” Paris. France adopted the trials called “à outrance” for the choice of the cast iron (fonte de fer) to be utilized for guns and howitzers. This consisted by the fusion of 8 pdr guns with the various cast iron materials and in its trial use off-limits (poussé à bout). Napoléon eliminated the 3 pdr. mountain guns adopted in 1803. At Trafalgar two cast iron guns exploded aboard of the French frigate La Redoutable. In the army, apart of the regimental artillery, each infantry division got an artillery battery of 10 pieces, each cavalry division (avant-garde de Corps) got a 6 pieces battery, each Corps received 8 - 12 pdr pieces as Réserve. Napoléon estimated that 16.000.000 lb of powder will be necessary in order to defend France. In Austria they made around 40 bronze guns per week. In the British Gunners Guide appears the first description of the 1803-Shrapnel howitzer which employs lead balls. In France was observed a very good resistance of the pine wood gun-mounts, built by Saxons. Kingdom of Neaples adopted the French new An XI System for its artillery. New trials for the 3 pdr French guns; they warmed up too much by shooting in a continuous way. The trials with the british cast iron gave a 4 % of damaged guns. British first employ of the Shrapnels at Vimeiro battle; very good results. General Allix organized the westphalian artillery with single caliber pieces. Napoléon prescribed the adoption of the 6 pdr mortars to be used as the Coehorn mortars. They were forged at Toulouse but they went out so badly it was impossible to utilize. At Strasbourg there were 58 bronze guns and 1975 cast iron guns (this probably was referred to the Strassburg in Brandeburg, not to the French fortress). At Woolwich (England) Congreve raised the first Rockets factory. At Wagram were shot 82.000 gunshots (other source: 71000 as for Chambray). In order to destroy bridges (Lobau island) Austrian employed a “machine infernale” with a pole and a lighting device (à mât et boite en Boule). Austria began in 1778 to organize field artillery. In 1799 they had (in Italy) temporary divisions and part of the Reserve (Armée-Geschütz-Reserve) by each cavalry regiment. 1 -- On 1809 the austrian army was formally split in Corps, each having 2 divisions (one Light and one Line infantry divisions). Light infantry divisions had 2 brigades (each of 3-4 light battalions), 1 cavalry regiment and 1 horse battery. The Line (heavy) divisions had 2-3 brigades (each with 2 regiments). Each regiment had one battery (so there were 2 batteries for brigade). There was no cavalry. 2 – The whole 1809 campaign Reserve artillery in Bavaria was 60 pieces (guns/howitzers). n Light Batteries : 8 pieces of 3 pdr. or 6 pdr. These had to be attached to the brigades so they were called Brigade artillery. n Heavy batteries: 4 pieces of 6 pdr. or 12 pdr. and 2 howitzers of 7 pdr. These were commonly named as Position artillery and they were divisional assets. This divisional artillery represented also the Corps artillery. n Park artillery or Reserve: marched with the army and was the replacement unit of the whole system. The ammunitions field depots (Protzen) did stay 10 “schritte” away from the guns, the pack animals (4 for each gun) did stay utter 10 “schritte” in the rear of the depots, the wagons of the ordinary foot-batteries were 40 “schritte” away from the guns – all probably variated with the terrain. TOTAL = 76 batteries and 518 pieces. Interval between pieces was around 10 schritte  (paces) while for the horse artillery guns was 15-20 schritte. the ammunitions were part in the so called Protze (an advanced cavalry ammunition depot), part in the wagons (Munitionsgeschützkarren), part carried by pack-horses. Note that the ordinary Geschützkarren of the foot artillery and the cavalry pack-horses did manoeuver with the guns. The last resource for ammunitions was the Protze. Following an Order of the Hofkriegsrat (August 9, 1807) in Cavalry and Artillery would have been enrolled no former Deserters or foreign soldiers, while the German infantry was allowed to enroll foreign citizens, but only in low numbers. The official birthdate of the new Austrian artillery System was 1808, when the Hofkriegsrat authorized the so called Batteries system. The batteries were supported by Train and so from 10 Fuhrwesensdivisionen each with 180 - 203 horses. Otherwise the definitive detachment of the regimental artillery into the new light batteries was delayed till the new horse’ “levée” (Pferdeconscription). In all the Erbländer also horse fell under the conscription, after their 4th year of age, and were classified in accordance with their fitness. These were called Landespferde, differentiating them from the horses owned by the K.K.Heer (Ärarische pferde). For three common artillery batteries (ordinäre Batterien) it was necessary to organize an artillery Train unit (Artilleriefuhrwesensdivision); similarly happened to the cavalry batteries (2 Cavaleriebatterien for one Artilleriefuhrwesensdivision), where about 200 horse and 100 servants could be just controlled by 1 officer, 1 or 2 Wachtmeistern and 9 Corporals. There was an utter 4th Echelon called Unterstützungsreserve, a (supposedly) larger ammunitions depot. These were attached to the army Corps and, finally at Wagram, directly to the batteries, with an infernal spreading of bombs and grenades. The second artillery regiment had another more Staff officer who was the Commander of the Feldzeugsamt and one Fourierschütze more than the first one present. 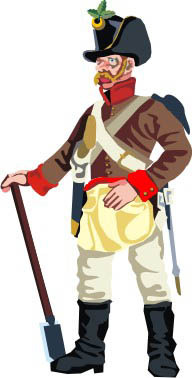 The actual commander of the Feldzeugsamt was a Staff Officer (with his own Fourierschütze) and he was attached to the 2nd artillery regiment. The artillery assistants (Artillerie Handlanger Corps) had 4 divisions or 8 companies (the Staff was at Vienna) and the companywere splitten divisionally between the 4 regiments. Their force was established in the force-report of August 10, 1811 (Standes-Ausweise). - Commander: Oberst Wenzel von Frierenberger. - Commander: Oberst Friedrich Funk von Senftenau. - Commander: Oberst Prokop Sonntag von Sonnenschein then Oberstlieutenant baron Joseph Russo von Aspernbrand. CORPS-ART. RESERVE = or Corps Pieces Res. = Res. battery Res. Art. Hauptreserve) Subdivided into Main Reserve (Hauptreserve) and heavy Reserve (Schwere Res.). At the end of the campaign existed also a common artillery Reserve (Res. Artillerie Armée Geschütze) where some of the position batteries did stay with infantry Divisions. GARNISON artillery: in fortresses and Place-commands. All units were attached to brigades (Divisions) or to parts of the Bombardier Corps. - Commander: Oberst Joseph Smola. - Recruitment: German infantry districts. - Commander: Maj.-Oberst Adolph Geiger. - Commander: Oberstlieutenant. Carl Friedrich Maresch von Marsfeld. The battalion of so-called Artillerie-Handlangers had 1.179 men in 8 companies (in wartime increased to 8 battalions). These men replaced the ad-hoc drawn 'German' infantrymen for moving the guns in combat. The handlagers were untrained personnel. In 1808 there were 8 companies of Handlagers, in 1814 their number increased to 30 and in 1814 to 33 companies. - Organisation: a) Austrian District b) Transylvanian (Siebenbürgen) District c) Croatian District d) Slavonian District e) Moravian District f) Banat District g) Hungarian District h) Bohemian District i) Inner Austrian District k) Galician District. - Commander: Maj.-Oberstlieutenant Lorenz Zierwurz. - Commander: Maj.-Oberstlieutenant. baron Ferdinand Kulmer. Div. Siegenthal 1 Horse battery Brig. Altstern 1 Brig. battery Brig. Wied Runkel 1Brig. bt. Reserve Corps artillery 2 Position battery (12 pdr. ), 1 Position battery (6 pdr.) - 4 Position battery 1 Horse bt. - after Wagram : Div. Ulm, Brig. Hardegg 1 Horse bt. Reserve Corps artillery 2 Position battery (12 pdr.) - 4 Position bt. Div. Sommariva, Brig. Radivojevich 1 Kav battery - Brig. Stutterheim 1 Horse Battery , 1 Brig. battery (3 pdr.). Brig. (detached ) P. Vecsey 1 Brig. bt. Div. Klenau (Vorhut) 1 Horse bt. Reserve Corps artillery 2 Position battery (12 pdr.) - 4 Position battery 1 Horse bt. 2 Position battery (12 pdr. ), 1 Horse battery - 1 Position bt (12 pdr. ), 1/2 Horse Batt, 1 3 pdr. bt. Brig. D’Aspre 1 Brig. battery (6 pdr.) - Brig. Clary 1 Horse Batt - Brig. Schneller 1 Horse bt. - Wagram: Div. D’Aspre, Brig. Merville 1 Brig. battery (6 pdr.) - Brig. Hammer 1 Brig. battery (6 pdr. ), 1 Brig. battery (3 pdr. ), 1 Brig. bt. Div. Prohaszka, Brig. Murray 1 Brig. battery (3 pdr.) - Brig. Steyrer 1 Brig. battery (6 pdr. ), 1 Brig. battery (3 pdr.) 1 Brig. bt. Brig. Fenner 2 Pieces , 3 pdr., 1/2 battery 6 pdr. Brig. Marschal 8 Pieces - 1/2 Brig. battery 1 Position bt., 2 3 pdr. Brig. Schmidt 4 3 pdr. 1/2 Horse bt 1 Position Battery - 6 Brig. battery (3 pdr. ), 1Brig. bt (6 pdr. ), 2 Position battery (6 pdr. ), 1 Position battery (12pdr. ), 2 Horse Pieces or also 3 Brig. Battery (3 pdr. ), 3 Position Battery (6 pdr. ), 1 Position bt (12 pdr. ), 2 Horse Pieces bt. 2 Brig. battery (6 pdr. ), 2 Position battery (6 pdr. ), 1 Pos battery (12 pdr. ), 2 Horse Pieces bt. from: Belleville Pr.Lieut., Über di Verwendung der Artillerie im Feldzuge 1809 in Bayern, Munich 1876 in Archiv für di Artillerie- und Ingenieur-Officiere des deutschen Reichsheeres. The first general who gave importance to the tactical use of artillery was Frederick the Great. He created, in effect, the regimental (battalion’s) artillery, in order to manoeuver the guns with infantry. In the same time, otherwise, he organized also a brigade’s artillery composed by 6-10 guns, to gain also the advantages of a more concentrated fire. Ce qui fait, pour les pièces de régiment , un total de 116 pièces, desquelles il faut ôter ce que vous avez dejà fourni. Le corps du duc de Rivoli. . . . 60 pièces. n.: Je ne comprends point dans ce compte les alliés. Une demi-batterie de 3 piéces pour chaque division de cavalerie légère; ainsi il faut pour la division Montbrun et pour celle que commandait Lassalle, 48 pièces d'artillerie légère. Pour la garde, il faut compter d'a-bord 60 pièces telles qu'elles existaient avant la bataille. 24 pièces dont j'ai ordonné la formation à Strasbourg. De plus, je désire avoir sous le commandement du général de l'artillerie de ma garde, pour suivre sa destination, une réserve de 19 pièces de 12 et 6 obusiers servis par l'artillerie à pied, faisant 18 pièces, ce qui portera l'artillerie qui suivra la garde a 102 pièces ; plus, 4 divisions, chacune de 6 pièces, savoir : 16 pièces de 6 e 18 obusiers servis par l'artillerie de la ligne, faisant 24 pièces; ce qui formera une réserve de 44 bouches à feu qui, avec les 84 pièces de la garde, feront une réserve de. . . . 126 pièces. Total général.de l’armée.. 699 bouch. Pascal Adrien, Correspondance inédite de l’Empereur Napoléon avec le commandant en chef de l’artillerie de la Grande-Armée, pendant les campagnes de 1809 en Autriche, 1810-1811 en Espagne, 1812 en Russie, Paris, Dumaine ed. 1843. Most european barrels were made of bronze, a mixture of 100 parts of copper with 10 parts of tin. In Austria the cast iron was used for the heavier Verteidigungs (defence/fortification) guns as it was stronger to sustain the larger charges, but it was less resistant to time than bronze. France used wrought and cast iron for the coastal and naval artillery. Wrought iron was already known to be a better material, but the production process was difficult and expensive. In Austria the guns were manufactured at Vienna, Graz, Prague, Pest and Hermannstadt (Banat), but most were made at the foundries near Vienna and at Mechelen (Malines, now in BeIgium). Iron guns were made at Mariazell and Reschitza in the Banat, where there were substantial iron and coal supplies. French foundries (as for the Imperial Act of 27 nivose An XI – 1803) had an autonomous Direction Générale at Paris, with some Sous-Directions, in the areas in which the foundries were concentrated. For the Ardennes “arrondissement” the Sous-Directeurs were at Charleville or Mézières, for that of Moselle et Sarre they were at Metz or Sarrebruck, for the piedmontese foundries the siege was Turin. Austrians did measure distances in paces (Schritte) or 0.63 meters. One Schritt = 2 Füsse (1 Füss = 31,6 cm). The true austrian lenght measure was the Zoll (inches). 12 Wiener Zoll made a Fuss (and two Füsse made a Schritt). The Zoll was equal to the current 26,34 mm (the Fuss pair to 31,6 cm or 1 ft and 0,4 inches) or 1,04 in. (UK Imperial inches). In France the artillery lenght measure was the Toise. It was originally introduced in 790AD and represented the distance between the fingertips of a man with outstretched arms, equivalent to the English fathom. Its length may have varied over time but it is considered equal to 6 pieds, 6,395 feet, or 1,949 meters. Feet of different lengths were used in France, but based on the 18th century Paris pied the toise equals 6,395 (English) feet or 1,949 meters. This unit was widely used in the 19th century and hasn't died out entirely today. Note that the French have a second fathom-size unit, the bronzee, equal to 5 pieds (about 1,624 meters or 5,328 English feet). The bronzee was the unit commonly used at sea, while the toise was used on land. Here the weight measures of the gun calibers (catalogued for the weight of the balls shot) are made simpler using the pdr. (pounders, Pfünder for Austrians). However there were some important differences between French and Austrian measures. Austrian measured weights in Löth, 32 of which made a Wiener Pfund (Austrian pound). 1 Löth was equal to current 17,5g (0.62oz.) so a Pfund was 560g and equal to 1,235lb (Imperial pounds). At least 100 Pfünder made 1 Zentner (56Kg). For example a 3 pdr. austrian light gun was really a 3,7 equivalent French pdr. (more similar to a French 4 pdr. ); an austrian 6 pdr. gun was a 7,4 equivalent French caliber and so on.